The following is a 500 yard 7mm Rem Magnum ballistic chart that was created using our free online ballistic calculator and details all aspects of the bullets trajectory from the millisecond it leaves the barrel until the time it reaches the 500 yd mark. It charts everything; drop, time, energy, velocity, range, and does so in 50 yard steps that are easy to understand. The stats are generated using both a 7mm Remington Magnum, Winchester Ballistic Silvertip, 140g (ballistic coefficient 0.46) and a 7mm Remington Magnum, Winchester Ballistic Silvertip, 150gr (ballistic coefficient 0.493) being fired at a velocity of 3100fps from muzzle point blank, this also takes into account the standard 1.5" scope height, and a gun that has been sighted in at 100 yards. 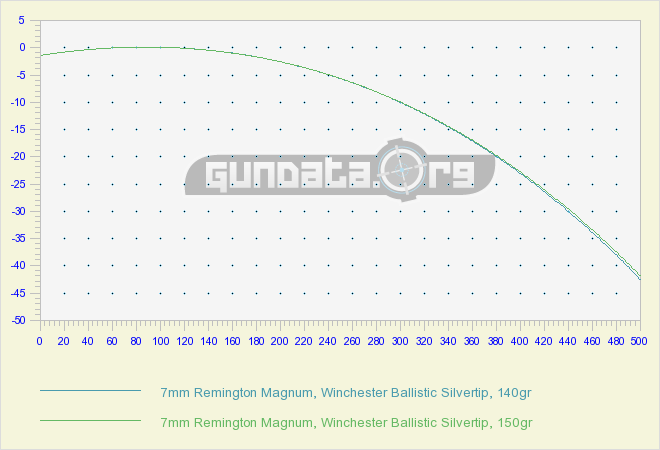 If your 7mm isn't close to these specs, or if you are a sniper or into long range shots you may want to take this a step further and use our ballistic calculator to create a custom 7mm Remington Magnum ballistic chart to take into account variances. You can then also add atmospheric conditions and angles.